Since Saturday June 16, la Cumbre volcano with 1476 meter above sea level which occupies the largest of Fernandina Island with 642 km2 of surface, the volcano entered in process of eruption then of 9 months of the last manifestation and Galapagos Center Expeditions when were in operations in the islands with passengers international they were witnesses of wonderful event but the same time respectable show of nature. They were surprised by this show unexpected that besides feeling fear, they could see fascinated as the volcano appeared before the eyes of all with emissions of smoke and lava flows that runs in one direction until reaching the sea, so that species such as iguanas of land and marine , endemic rodents, snakes, penguins and finches that inhabit the island, would not have greater impact according to the Director of PNG, however, they are being monitored to document the changes that this natural geological process produces on ecosystems and their respective ecological and evolutionary processes. 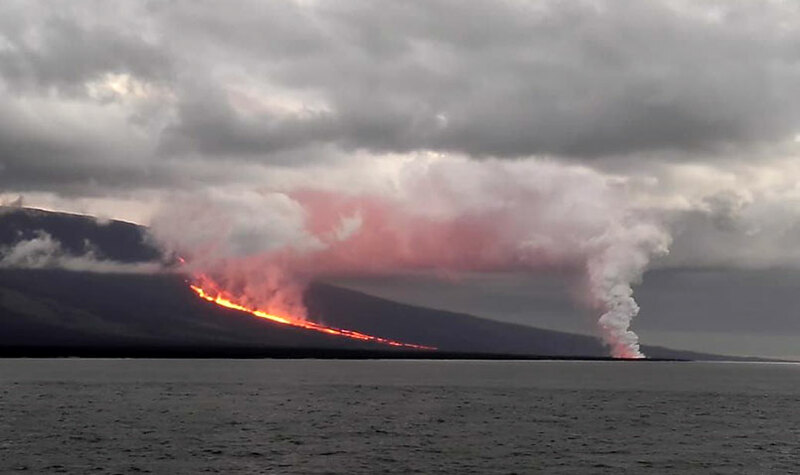 This eruptive process can last several days even weeks with the same behavior besides feeling earthquakes that besides feeling earthquakes ranging from 2.5 to 4.1 degrees, however, this does not affect to activity touristic in the Galapagos Islands, the authority only asks precautions and avoid get closer to the place. Galapagos center expeditions shares with you some photos of this magnificent event natural geological.